The orbit of Venus has a highly aesthetic cycle. Every eight years, “she” goes retrograde five times, describing a pentagonal star around the zodiac. During these repeating cycles, the goddess descends below the horizon to commune with the Sun, pulling us deep into a personal process of emotional alchemy. This periodic exercise in heart intelligence works individually and in relationships, developing throughout our lifetimes. Everyone loves Venus. Yet not everyone, not even most astrologers perhaps, understands the depths, complexity and aesthetics of the cycles and phases of our sister planet. Being the brightest light in our sky, apart from the Sun and Moon, Venus is the most closely observed planet by all peoples. Her cycle of 584 days is often considered to start at her “new Venus” conjunction with the Sun, when closest to Earth and in retrograde motion. During her synodic cycle, from new Venus to new Venus, she appears as both Morning Star (260 days) and Evening Star (260 days), giving her two “personalities.” There are also two times of invisibility when she is engulfed in the light of the Sun, taking a “Sun bath.” One is when she is closer to us than the Sun (interior) and the other when she is around the other side of the Sun (exterior). These are time when she seemingly descends to the underworld. Myths from all over the world tell of this descent. The best known in the west is the myth of Demeter’s daughter, Persephone, who is taken to the underworld by Pluto. In the Greek myth of Psyche & Eros, one of the tasks assigned to Psyche by Venus was to obtain a vial of beauty cream from Persephone, now Pluto’s Queen. Psyche went on this dangerous journey and succeeded, but she then fell into a swoon when she sought to use a dab of the cream to be more beautiful for Eros. He swooped in to revive her. An older myth, one of our very oldest written myths, is the story of Inanna, the Sumerian Venus, which describes its astronomical cycle. This myth, written on clay tablets, was discovered in the sands of modern Iraq. These three myths, among others, give us clues to the process of the Venus retrograde journey, which we can apply to our own experiences. -in our finest art, music and architecture. This mathematics brings forth the greatest harmony. It is the way our world is designed. Therefore Venus is the Goddess of Beauty (ruler of Taurus). She is also the Goddess of Love (ruler of Libra), who wrote the famous Law of Attraction. Briefly, this law states that our quality of life is a reflection of our emotional state of being, which attracts experiences and relationships into our life. Self Love is key, and a strong theme of Venus. In each 584-day cycle there is a retrograde period that lasts around 40 days and 40 nights (some shorter, some longer). Over the course of 8 years there are 5 such periods, in 5 different signs that repeat over and over, 2 days and 2 degrees earlier each time. These cycles change sign slowly, revisiting 5 places in our charts over the course of our lifetimes. These are times we are called into our hearts, to reevaluate our lives and loves. This are times of alchemy when we make “honey in the heart,” enhancing our emotional intelligence. It is said that the heart is the most intelligent organ in the body, radiating the most vibrant energy and informing the brain. How grateful we can be for these special times of heart education that draw us deeper into our essential selves. Our essence is that part of us that is unconditioned by our personal life history. 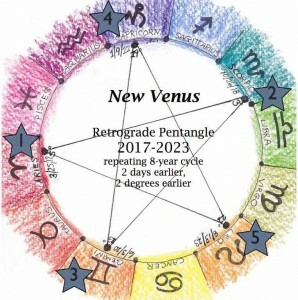 The 5 Venus retrograde points describe a 5-pointed star, pentacle or pentangle around the zodiac, thus around our charts. These 5 points are revisited every 8 years. We can track these cycles to explore themes of emotional development in our lives. We can consider the sign and the house of these 5 sections of our own charts where we are making Honey in the Heart in our lives and loves. *Use the attached tables to track your cycles.